This first plate, It Girl Nail Art LE106, will be available only through Polish Pickup, between December 7th and 10th. My favorite things on this plate? 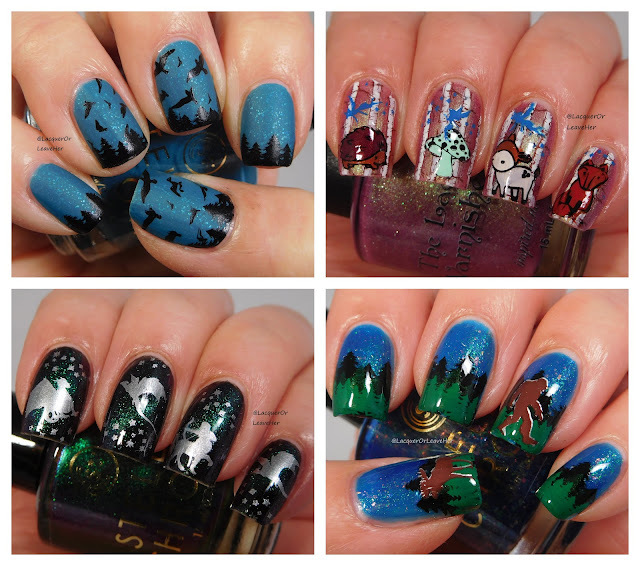 The dragons and griffon are awesome, of course, but I have to go with the hedgehog and the Bigfoot. Because, seriously--how adorable are they?? This second plate will be available in It Girl Nail Art's shop, and it's not limited edition, so you can grab it whenevs. But, if you buy the LE106 plate, you'll get a coupon to get IG314 FREE with any $25 purchase. And since she sells the most awesome cuticle oils and balms in addition to her plates and polishes, I could spend $25 in her shop in about a second flat. This one I did over Stella Chroma Flannel & Boots, and I stamped with Girly Bits Cosmetics Little Black Dress. For this one, I started with a base of Stella Chroma Mother Ginger, and stamped with Messy Mansion Ivy, Forest, Carbon, Pudding, and Sterling. For this one, I started with a base of Stella Chroma Orion (a black-jelly based magnetic polish) and stamped my images with Moyra Silver. For this one, I started with The Lady Varnishes Beetle Juice, which is also available only during Polish Pickup, and stamped with Messy Mansion Gingerbread, Pudding, Blue You A Kiss, Sterling and Chalk, Kaleidoscope Mint, and Sally Hansen Sand Storm. These plates are just plain fun. You can buy It Girl Nail Art LE106 during Polish Pickup between Dec. 7th and 10th, and It Girl Nail Art IG314 from her shop--and don't forget that if you buy LE106, you'll get a coupon for IG314 with any $25 purchase. Other issues: Dry time on this was super fast! When worn in its natural matte state, this is glowy and otherworldly. When worn with topcoat, the shimmer and the flecks leap out at you. This polish feels like it should be worn by some elf queen from Lord of The Rings lore, or, in light of the theme, some dancing forest fairy. It's ethereal, but at the same time, is an extremely flattering color for a range of skin tones. You can buy this beauty during Polish Pickup's December sale, between December 7th and 10th. 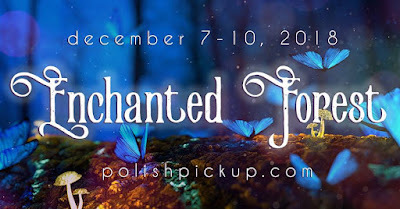 In the meantime you can check out The Lady Varnishes' other beauties, and can come hang out with the Polish Pickup Pack. 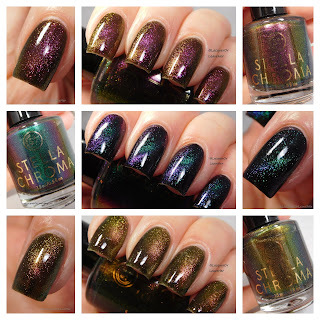 I'm back with one final trio from Stella Chroma that will go on sale this Black Friday: The Constellations Trio, which is a gorgeous set of multichrome magnetic flakie polishes--and if it has multichrome and flakies, I'm IN. All of these polishes are black-jelly based, and so can be either worn alone (opaque in 2-3 coats), or can be worn with just 1-2 coats over undies. I'll do a comparison of those two methods with the last polish so you can see both options. Coverage: 2-3 coats; I'm wearing two in these pictures. Formula: Excellent formula and application. Other issues: Great dry time, easy-as-pie removal. I was interested to see how a black-jelly based multichrome would perform as a magnetic; as with most multichromes, in some lights you get mostly one color, but in other lights you'll get a completely different color--but, you'll see that color shift within the area that your magnet has highlighted, which is very, very cool. Gemini has a tiger's-eye feel that I love--I've always been partial to that gemstone and this really reminds me of it. I love the olive-rust-gold interplay, especially this time of year it makes me think of renaissance Christmas tapestries. I included a picture in this batch that shows the polish in light that highlights the main color, to show you that the magnetic slash is really there and forms well--when the duochrome hits, the camera shows the awesome color shift but doesn't differentiate the magnetic shift as much. This makes me think of a gilded vineyard--I don't know what that even is, but this polish looks like it. Gorgeous deep green vines with deep violet grapes, dusted with sprinkles of gold. So pretty any time of year, but so festive for the holidays! I love all three of these polishes hard-core, but this one is my favorite. These colors are so differentiated, they're like gemstones dancing on your nails, or like the most amazing little universes! I love staring at the polish, and I love staring at these pictures. Love, love, LOVE. As you can see, just one coat still gives a strong magnetic effect. The plus of putting the polish over undies is that the magnetic effect is sharper--and, of course, your bottle of gorgeous polish lasts longer (and I'm not gonna lie, I'm cheap economical like that). But, wearing the polish on its own gives a more saturated magnetic effect with more depth, one that's more spread out over the nail. So it's really about which look you prefer. This trio will be available in Stella Chroma's store on Black Friday at noon EST; you can purchase each separately for $13 or the set for $36, through December 7th. And, from Black Friday--Cyber Monday, she's offering free domestic shipping with any purchase of $25 or more--no code required. She'll also give a free upgrade to domestic priority shipping from Dec. 14-19, since the 19th is the last day to ship in time for Christmas. And a portion of the proceeds of all the polishes that Stella Chroma sells during the last quarter of 2018 will be donated to GirlStart, a non-profit based in Austin, Texas that helps young girls develop interests in STEM. Stella Chroma LE Holiday Duo! The Digit-al Dozen Looks Up, Day 4: Crows! Digit-al Dozen Day 2: Look up!